After every Bristol Motor Speedway race, it’s rare to see a car that doesn’t sport the concrete beast’s badges of honor. At the end of the Bass Pro Shops NRA night race, Kurt Busch’s No. 41 Monster Energy/HAAS Automation Ford Fusion also wasn’t in showroom condition, but it got the job done. Starting in ninth position, Busch raced inside the top 15 for more than 90 percent of the race. Despite heavily damaging the front clip of his car on Lap 4, the Las Vegas native kept focused, finishing seventh in Stage 1. Placing ninth in Stage 2, the veteran willed his way to the second spot. On the penultimate restart, Busch drew even to leader and teammate Clint Bowyer on lap 477. As the field made its way into turn one, the 2004 Cup champion took the lead, an advantage he would not relinquish for the final 24 laps. Looking more like he did when he won five previous races at the 0.533-mile track, it’s safe to say the veteran soaked in his first win of the 2018 season. Snapping a 58-race winless streak that dated back to last year’s epic Daytona 500, Busch counted his blessings with his team and his car holding together all night long. Much like his win in “The Great American Race,” Busch’s No. 41 Ford looked like a stock car from the 1990 film Days of Thunder. With tape holding the hood together, one could say it made this winning car live up to Monster Energy’s raw, rugged image. 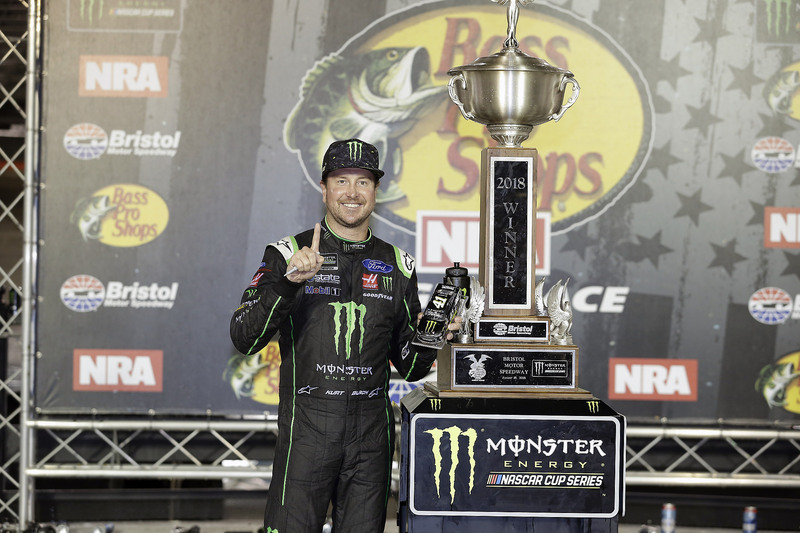 Above all, Busch relished his latest NASCAR triumph, his 30th career Cup win that showcases his evolution into a more seasoned, calculating driver. Drop the hammer on your browser toLionelRacing.com or dial 1-800-952-0708 to order what’s sure to be one of the more exciting Raced Version die-cast in your collection!